Open carry is for confident straight shooters. 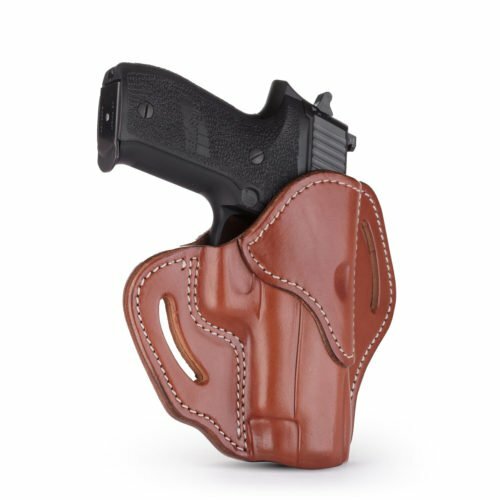 We believe that a secure holster is part of the responsible exercising of the law and a citizen’s Second Amendment rights. With handsome leather open carry holsters from 1791 Gunleather, your firearm is on display and there is no question what you’re packing. 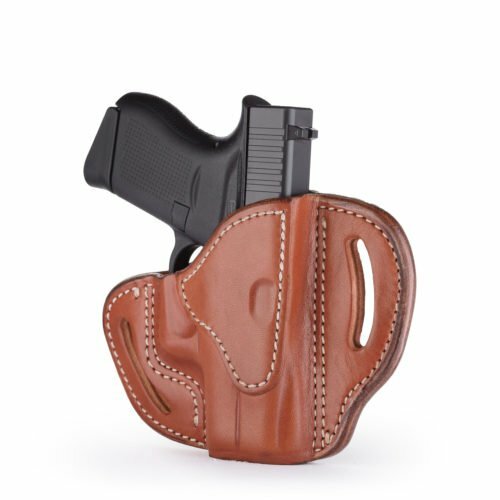 Our holsters work particularly well for law enforcement or out on the range, but anyone living in a jurisdiction that allows open carry can tote their pistol visibly. Different types of open carry holsters vary by design, material, fit, performance, and security. Contact us by phone or email if you have any questions about choosing the right holster for your trusty firearm. 100% Certified American Heavy Native Steerhide leather that conforms to your body for ultimate comfort. Bluing-protective hand-finished interiors and detailed exteriors from fourth-generation leather artisans. Reinforced stitching for a secure fit that upholsters easy once broken in, but will not warp with time or use. Attractive dyes in Stealth Black, Brown on Black, Signature Brown, or Classic Brown that will not bleed. Multi-fit designs to accommodate individual conceal, carry, draw, cant, and position preferences. 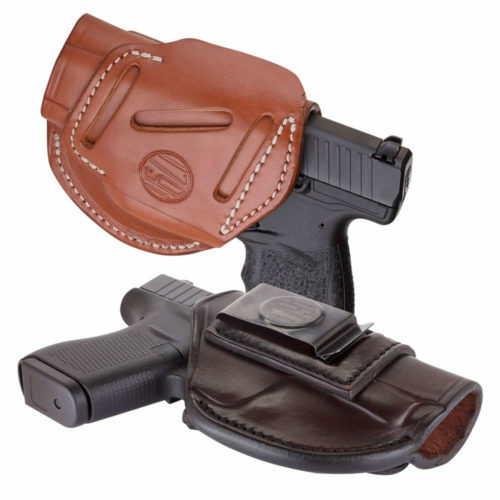 Competitive pricing, between $35 and $55 a holster, with no trivial brand name upcharges. A lifetime warranty with hassle-free exchanges, refunded returns, and top-caliber customer service. The best open carry holster boils down to individual comfort. 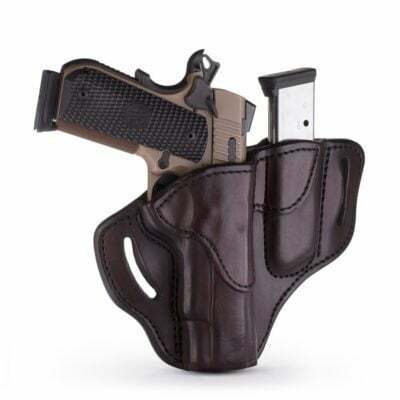 You can openly carry with shoulder, drop leg, belly band, ankle, or cross-draw holsters, depending on where you prefer to wear your firearm and how you feel most confident drawing to a firing position. 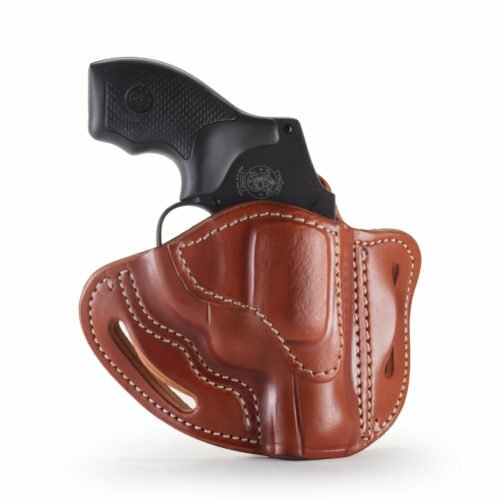 The most popular style happens to be our specialty: the OWB off-the-hip holsters. 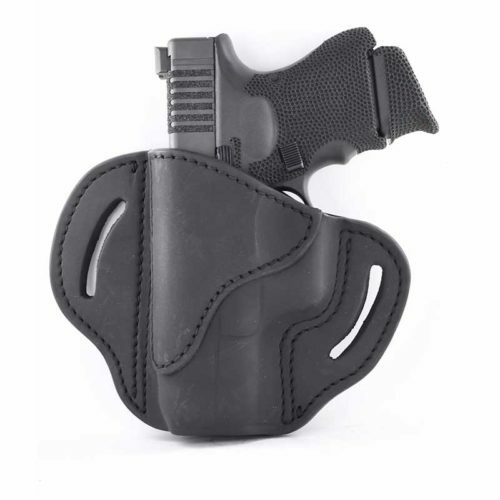 The majority of users will find these open carry holsters function best for accessibility and retention. What is the Proper Open Carry Positioning? 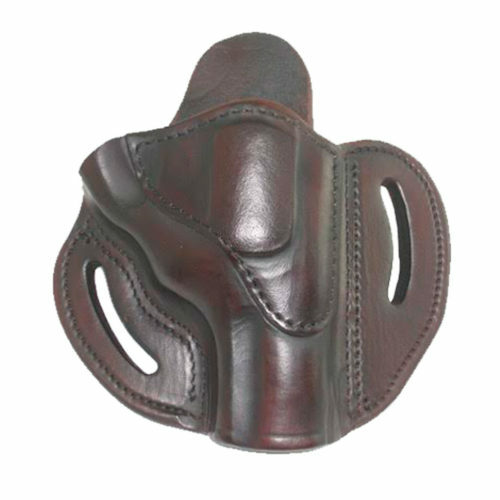 The 1791 Gunleather hip holsters are securely attached with belt clips fastened to your favorite gun belt. 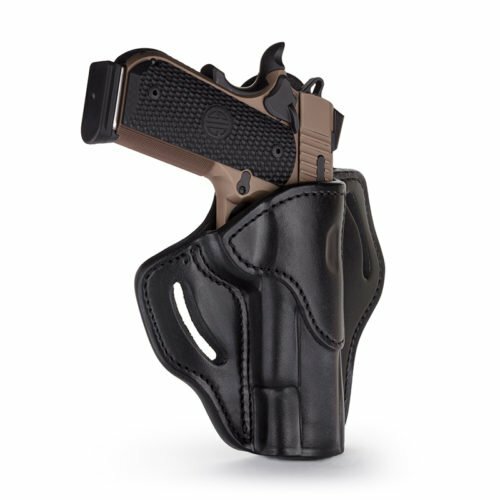 Once your holster is firmly attached to your body, you can position it straight and narrow at three o’clock on the right hip or at nine o’clock on the left hip. Users like positioning the handgun a little further from the body to allow for a quick, confident grip. From there, you may opt for additional security features — or not. It’s all a matter of personal comfort and preference. 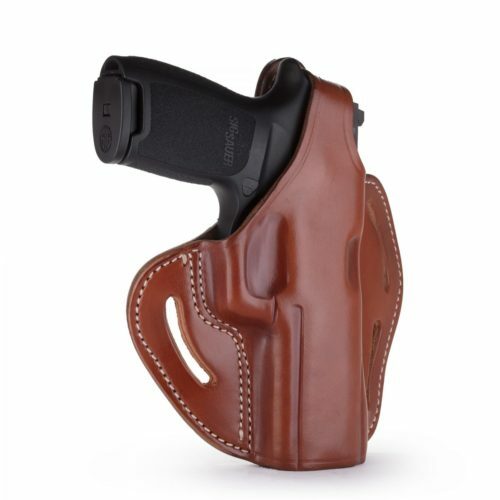 All 1791 Gunleather holsters are designed for excellent retention, whether they feature a thumb break or not. A thumb break retaining strap is a safety device installed to keep the gun firmly in its holster until intentionally released. Some gun owners prefer the security of a thumb break, particularly if they possess a firearm for work purposes and do not want an unauthorized person to get a hand on the weapon. 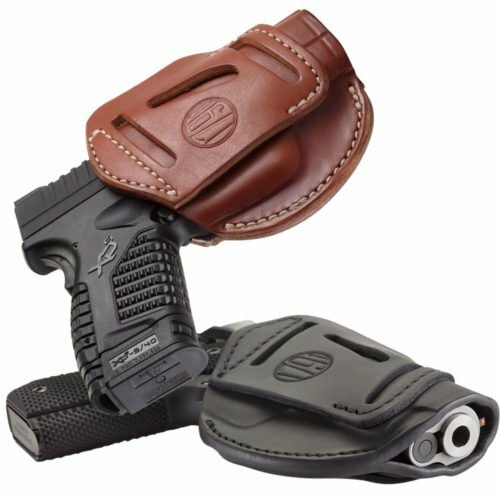 Both our 3 Way and 4 Way Open-Top Multi-Fit holsters have thumb breaks built in for added peace of mind. 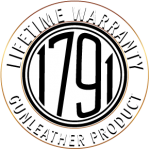 You can find 1791 Gunleather on YouTube for additional tips and tricks on getting the most from your new leather holster. 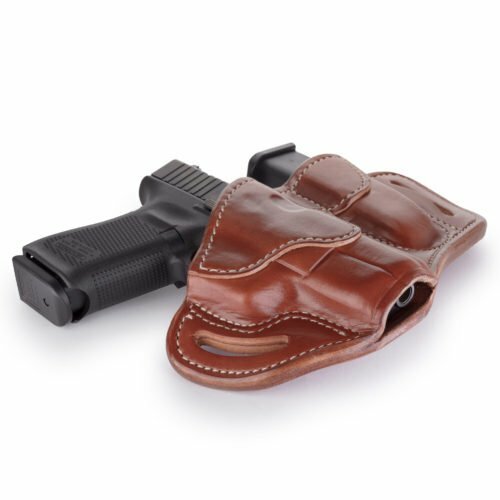 One of the considerations in choosing a leather holster, as opposed to thermoplastic, is that you’ll need to break it in a little. Like a good pair of shoes or wallet, a wet molding process is used to tighten the fibers for durability. Allowing the wedged gun to sit in its new holster for at least 24 hours. The ability to openly carry is a distinctly “American” right — something that pro-gun advocates are free to celebrate. Exercising our Second Amendment rights is a step in the right direction and a show of support for gun reforms over restrictions. You may attract gun curious citizens interested in hearing why you choose to carry or you may find a greater sense of community among fellow sportsmen. If you’re carrying a gun for personal protection, one school of thought says that criminals will think twice before breaking the law if they see someone wielding a gun is nearby. It is also quicker and easier to access a firearm that is not obscured by clothing. A fraction of a second can make all the difference in a life-or- death situation. Comfort is one last reason to consider. It’s inarguably more comfortable to wear a handgun tucked outside the belt, rather than inside. 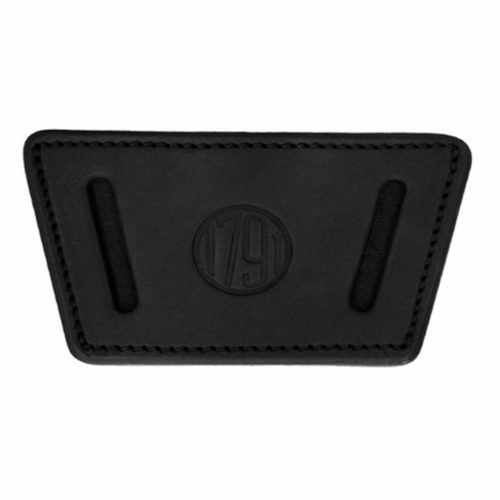 A hard material pressed up directly against the hip bone can be very uncomfortable with long periods of use or when seated in a vehicle when compared to OWB slide holsters. Concealment wearers often have to purchase clothing several sizes too big or wear bulky layers to hide their firearms. Open carry allows you to tuck your shirt in or skip the jacket on a hot day. Whether you like them big or small, you can openly carry your handgun of preference if you’re not worried about concealing it. One drawback of open carry is that you lose the element of surprise, which may be an advantage, depending on the situation. Some attackers consider armed citizens their first targets if they are in the act of committing a crime. Other gun owners like to keep a low profile and worry that openly carrying a weapon will invite unwanted comments from anti-gun crusaders. Guns can cause alarm or panic among people who do not own weapons and store patrons who may not understand the law. 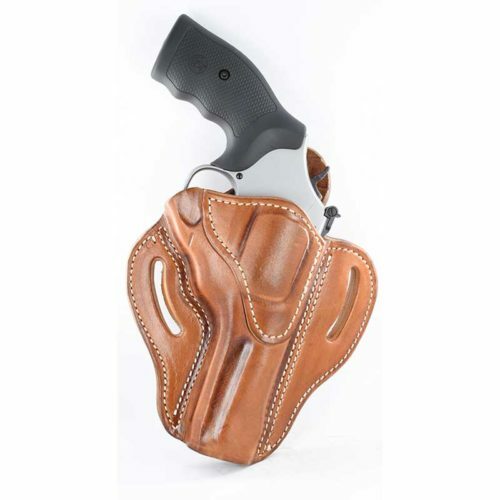 If you’re not sure whether you’d like to open carry or not, you can always purchase the 4 Way Holster, which allows for OWB open carry and IWB concealment as well. We are a small company based out of Florida, selling directly and at more than 1,200 dealerships in all 50 states. 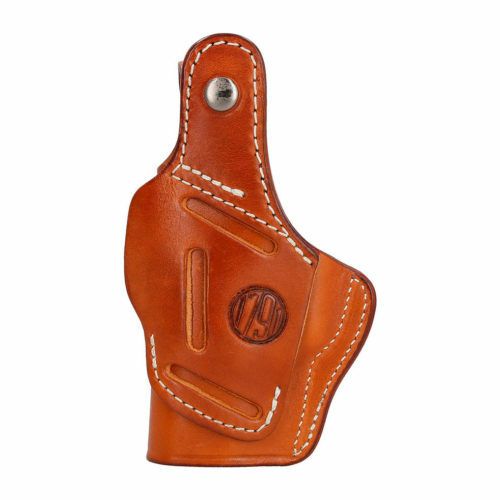 Every 1791 Gunleather holster is custom-handmade by a fourth-generation leather artisan, using 100% Certified American Heavy Native Steerhide with high-quality dye and reinforced double stitching. You’re probably not used to excellent service and quality craftsmanship at such an affordable price. But, as a new upstart, our affordable prices are amending the gun holster industry, one holster at a time. We support law enforcement and veteran charities like Anteris Alliance and Wounded Warriors. 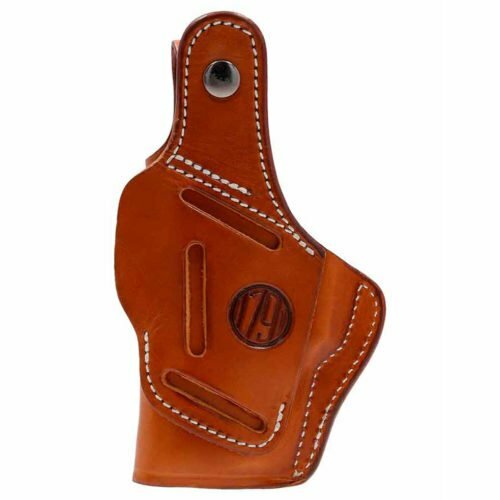 Contact us for personalized assistance in the selection of your open carry holster.